This week’s BTN is brought to you partly via the editor-in-chief on board Cunard’s Queen Victoria. Look at the ship’s web cam to find out where she is, bearing in mind when it gets dark you cannot see anything. He saw the ship in Liverpool last summer, but no chance then of getting on board. (see BTN 1 June 2015) BTN’s Richard Cawthorne viewed Victoria in Sydney and was impressed. CRUISE INTELLIGENCE is all about the mega-yachts which seem to be in vogue now. These are for fare-paying discerning holidaymakers and not oligarchs. Over the past 176 years, 248 ships have flown the Cunard flag since the company inaugurated the first scheduled service across the North Atlantic in July 1840 and the company fleet list certainly contains the names of some of the most famous ships ever built. But what is in a name? The story goes that in 1934 Sir Percy Bates, chairman of Cunard, requested of King George V that the new super liner be named after Britain’s greatest Queen. “Yes” came the response “my wife would be delighted”. And hence you have Queen Mary, berthed at Long Beach, perhaps the most famous ocean liner of all time. With her sister ship Queen Elizabeth, Churchill was led to comment that the Cunard Queens had shortened the Second World War by “at least a year”. She was the star of the North Atlantic before her retirement to California in 1967. Queen Mary 2 (QM2) is a worthy successor, ordered in 2000 and making her maiden voyage in January 2004. 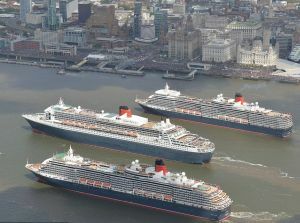 In 2014, Prince Philip was on board to help celebrate her 10th anniversary, and last year Liverpool partied, rejoicing in the 175 years of Cunard, when Queen Mary, Queen Victoria and Queen Elizabeth cruised down the Mersey. Now 12 years old, RMS Queen Mary 2 is about to be transformed in what the company calls a “remastering”, a 21st-century art deco masterpiece. Do not try to book her for a transatlantic voyage between 27 May and 21 June, as she will be at the Blohm+Voss Shipyard in Hamburg, having a great deal of money spent on her. “The 2016 refit for Queen Mary 2 is certainly the most substantial dry dock to date for our flagship. It is our aim that the newly designed and refreshed spaces will exceed our guests’ expectations, and further elevate luxury on a grand scale on Queen Mary 2,” said Richard Meadows, president of Cunard, North America. The success of introducing single cabins on the much smaller Queen Elizabeth and Queen Victoria will be replicated on QM2 with 15 solo cabins against nine. Also redesignated are an extra 30 large Club Balcony staterooms, dining in a separated area of the main Britannia Restaurant and with no fixed times. The concept has proved to be very popular. The Verandah restaurant will make its first appearance on Queen Mary 2, 80 years after the first Verandah Grill on a Cunard ship appeared on Queen Mary. That grill featured artwork inspired by the circus and a striking black carpet. Circus-inspired artwork and a black geometric carpet design will link the latest Verandah to the past. During the refit, both the Princess and Queens Grills restaurants will be redesigned, offering more tables for two. Renovations also will extend to the Kings Court buffet, which will have a “more open central buffet area,” and reconfigured seating arrangements. The refreshed venue will sport new menus, and have pre-set tables and waiter-served drinks. The popular Chef’s Galley area, serving Italian pastas and pizzas for lunch, will offer a Chef’s Table tasting menu on select evenings, featuring insights from the executive chef and paired wines. Out goes the Winter Garden, renamed Carinthia Lounge. It will have a dedicated patisserie and serve breakfast and lunch plus afternoon tea. Come evening, the atmosphere will evolve into a gathering spot offering premium wine, small plates, and “relaxed entertainment,” Cunard said. In the higher accommodation categories, all Princess and Queens suites will receive a comprehensive restyling, says Cunard, with, for example, luxury carpet featuring design work inspired by rugs from the original Queen Mary. More ‘remastering’. The suites also will be reconfigured to maximise space. It’s not a ‘dog’s life’ on QM2. On the suggestion of regular traveller the Duke of Windsor, Cunard installed a lamppost and a fire hydrant in the kennel area and these two items will take pride-of-place in the refurbished and extended kennels. To meet strong demand – the line says they frequently sell out – a further 10 kennels are being created for four-legged travellers. As well as taking the original Queen Mary as a reference for the new designs, the now Southampton-based company has reached into its unrivalled past with art deco chandeliers and fixtures and fittings. Liverpool will be further remembered with artwork from the wonderful grand Booking Hall in the famous Cunard Building, one of the Three Graces, outstanding structures from a bygone era. Port Everglades, Ft Lauderdale, broke its own world record on Sunday 13 March, with a preliminary count of more than 54,700 cruise guests sailing in and out in a single day. The last world record was set just three months earlier on 20 December, when 53,485 passengers sailed in and out of the South Florida cruise port. The port hosted eight cruise ships including Carnival Cruise Line’s Carnival Conquest, Celebrity Cruises’ Celebrity Silhouette, Holland America Line’s Eurodam and Nieuw Amsterdam, Princess Cruises’ Regal Princess and Royal Princess, and Royal Caribbean International’s Allure of the Seas and Navigator of the Seas. Following the announcement of Scenic Eclipse (see BTN 7 March http://www.btnews.co.uk/article/9985) there has been a flurry of super yacht announcements with Crystal leading the way, and not far behind PONANT, France’s only cruise line, has ordered not one but four 184-passenger ships. Not really in the ‘super yacht’ class, somewhat larger, Viking Ocean Cruises has floated out Viking Sky, the third of six cruise ships it has ordered from Fincantieri, scheduled for delivery in February 2017. Months after the successful launch of Crystal Yacht Cruises and the 62-guest Crystal Esprit, Crystal is again upping the ante with the world’s first purpose-built polar class mega-yacht, Crystal Endeavour, 25,000 tonnes, 600ft long and just 100 guest suites. She will debut in August 2018. Named after Captain James Cook’s research ship HMS Endeavour, which discovered Australia and New Zealand nearly 250 years ago, the newly-built vessel will be designed for global expeditions in Arctic, Antarctic and tropical conditions. Crystal Endeavour will be the first purpose-built Polar Code-compliant yacht with a PC6 Polar Class designation. As such, she will be able to cruise in polar regions during the summer and autumn in medium 'first-year' ice, which may include old ice inclusions. She will also be fitted with the state-of-the-art offshore dynamic positioning technology, with computer-controlled systems to maintain automatically the ship’s position with its own propellers and thrusters. This will enable the mega-yacht to float above coral reefs and other underwater wonders without utilising anchors, which can damage the terrain. The 200-guest capacity Crystal Endeavour will offer extreme adventures by air, sea and land with a complete range of 'toys' which are not commonly found on today’s mega-yachts, including two helicopters and two landing pads for flightseeing expeditions, as well as two seven-person submarines, eight electric amphibious zodiacs, jet skis, wave runners, kayaks, fishing facilities, paddle boards, snorkelling and scuba equipment, recompression chamber, dive support tender and a multi-person ATV. The world’s only French flag cruise line and a leader in Polar expeditions, Ponant, has signed a letter of intent for the order of four ships from Vard, the Norwegian subsidiary of the Italian Fincantieri Group. The order is the first step in a project to expand the company’s fleet since it was bought by Artemis, holding company of the Pinault family, in 2015. The first ship is expected in 2018 and will join the Company’s emblematic sailing yacht Le Ponant and its sisterships, Le Boréal, L’Austral, Le Soléal and Le Lyrial, four state-of-the-art yachts built by Fincantieri between 2010 and 2015. In keeping with its philosophy, Ponant has again opted for small-capacity, intimate ships. The four newcomers will be around 10,000 tons and 420ft long 128m in length with 92 staterooms, and have a crew of 110. Ice Class-ranked and equipped with the latest technologies, these expedition ships will be easy to manoeuvre and able to reach sites that larger vessels cannot access.